Continental-coastal: outside local areas, trade was limited to thin networks of high value items with some (highly fluctuating) upward tendency in the extent of such networks, but no significant link between Afro-Eurasian trade systems and American trade systems. Oceanic-global: Europeans link the globe via exploitation of routes their explorations opened up, with silver the dominant trade item and non-local trade still limited to thin (though expanding) networks of high value items. 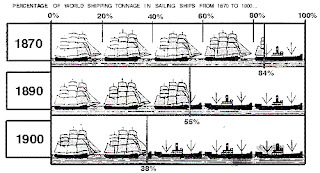 Atlantic-transition: Huge increases in the level of shipping (including through greatly expanded canal networks) creates an Atlantic economy on the cusp of mass trade, a matter of quantity having a quality all of its own. Globalised: From the 1820s onwards, steam (via steamships and railways) sets off an era of mass trade, which means Rogowski factor income (pdf) dynamics come to dominate the political economy of trade. With mass trade (without which there is not globalisation worth the name), trade seriously impacts the income of general factors of production (land, labour, capital). Outside the Atlantic economy, there is no globalisation worth the name until the 1820s (pdf) because the technology did not support the required level of mass trade. According to Angus Maddison‘s calculations (pdf), in 1800, merchandise exports were about 1% of world GDP: by 1913 they were 8%. One can tell that the Atlantic economy (particularly Britain) was on the cusp of mass trade as wheat prices converged (pdf)–wheat prices within the Atlantic economy (expressed in silver) narrowed from a range of 6.66:1 around 1400 to a range of 1.88:1 around 1750–and, in Britain particularly, free trade v protectionism starts becoming a political issue. Before that, the political economy of trade was about fighting over the rents from thin trade networks of high value items because trade was not “mass enough” to affect general factor incomes. Though such trade was disproportionately important for state revenues. Trade was overwhelming non-competing items, because transport costs were so high, it was very unlikely traded items could compete with local production. Once transport technology advances enough for mass trade, then scarce factors of production want trade protection to protect their scarcity premium from foreign competition. If an economy is importing a factor of production (or its products), then that factor of production is scarce in the local economy. So, importing food implies land is scarce, importing capital implies capital is scarce, importing labour implies labour is scarce (in the local economy). 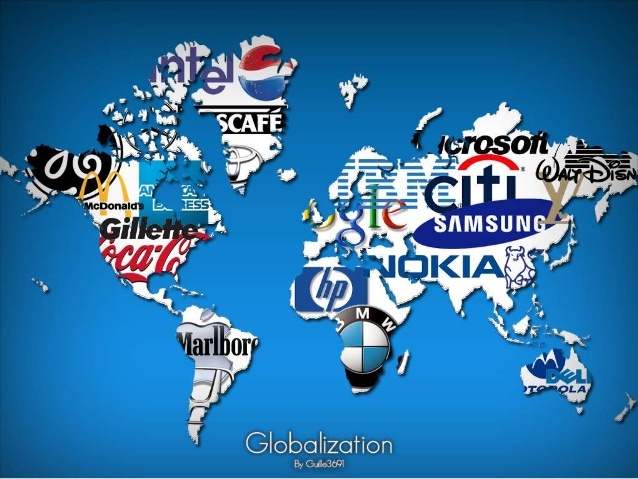 Plentiful factors of production want free trade to get access to wider markets, increasing their income (by increasing their sales and by reducing their costs through not having to pay local scarcity premiums). If an economy is exporting a factor of production (or its products) then it is plentiful in the local economy. So exporting food implies land is plentiful, exporting capital implies capital is plentiful, exporting labour implies labour is plentiful (in the local economy). In an era of mass politics, two out of three factors of production wins (domestic) political economy fights. Hence the broad patterns of the political economy of trade in the first globalisation era from the 1820s until the Great War. Britain exported capital and labour and imported food. Capital and labour were plentiful and imposed free trade against the wishes of (locally scarce) land. Germany imported food and capital and exported labour. Capital and land were (locally) scarce and imposed protection against the wishes of (plentiful) labour. The Anglo settler societies (Canada, US, Australia, New Zealand) exported food (and minerals) and imported capital and labour. Capital and labour were (locally) scarce and imposed protection against the wishes of (plentiful) land. Latin America had weak states, which relied on (easily imposed and collected) tariffs for revenue but also imported labour and capital, so moved to protection whenever powerful land interests could be overcome. 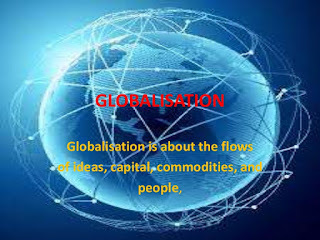 There was retreat from, and stagnation of, globalisation in the 1914 to 1945 period, largely due to the huge shocks to the global trade system of the two World Wars and the Great Depression. There was also some interruption to the pattern of declining sea transport costs (though vastly increased uncertainty may have been a factor in that also by affecting research and investment decisions). Globalisation continued to be driven by falling transport (mainly in air transport) and communication costs. * Which, along with other aspects of technology, began to have some unexpected effects on the patterns of mass trade. (Paul Krugman’s Nobel memorial lecture is an excellent summary of that.) As factors of production became more internally differentiated, this tended to favour free trade interests by breaking up pro-protection coalitions. As the breakdown in international trade was strongly associated with the disasters of the 1914-1945 period, this generated increased public policy commitment among the developed democracies to liberalising trade as part of a commitment to a more stable international order. (Capital-importing countries outside the developed world generally continued to tend towards protectionism.) Just as the dominant naval power of the 1815-1913 period, Britain, supported a liberal trading order, so, after 1945 did the succeeding dominant naval power of the US. Also, if your income is not directly affected by trade, you will tend to favour freer trade as it broadens choices and tends to lower prices. So, electorates with large public sectors and more welfare-dependent or retired folk are likely to tend to be more favourable to freer trade. Because the US is the dominant producer of intellectual property, the US government (both liberal and conservative administrations) will argue for low overseas taxes on multinational earnings, weak anti-trust laws to preserve the profits of US companies with patents, copyrights and/or large network externalities, and strong intellectual property rights, to extract money from non-American consumers of stuff developed in California. You might wonder why even liberal American politicians would defend the robber barons of California. The answer is simple; these firms produce lots of tax revenue for the US, and for California. They don’t want to kill the goose that lays the golden eggs. Nor do they want to share eggs with Europe and Asia. It doesn’t matter if our firms exploit consumers in Asia or taxpayers in Europe, as long as they share 30% of the loot with public employees in the US. And these industries are a very big deal, particularly for the US. Computer games are a multi-billion dollar industry, apparently overtaking films for export income. 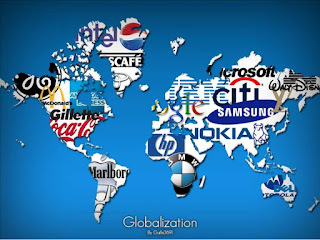 It is plausible to argue that it is precisely because we have global markets, that protection of IP by states in return for taxing the income therefrom has become a feature of international politics. On the horizon, we can see the rise of artificial intelligence (AI) and 3D printing. This seems likely to make the IP issues more salient, not less; both in their use and as the two technologies may well undermine mass trade in goods and services. Globalisation has been fundamentally driven by technology: in particular, falling transport and communication costs. Public policy certainly can affect (profoundly) how specific countries have interacted with the pressures and consequences of said falling transport and communication costs. Major breakdowns of the international political and economic order can even more so. Nevertheless, those falling costs created pressures and expanding opportunities that public policy responded to. 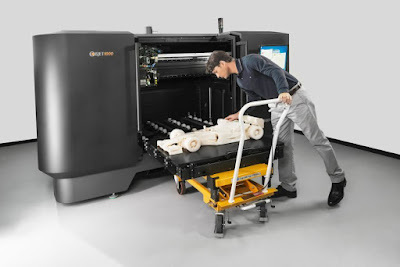 If technology now starts to strongly favour localisation, then that pressure will be reversed as technology will no longer be encouraging global connections in production and distribution of goods and services. If that is so, at least in terms of mass trade in goods and services, we may be approaching peak globalisation. * As air transport has increasingly bled off high value items (including people), this has tended to limit shifts in real sea transport rates, as technological improvement in sea transport is being applied to cheaper and cheaper (in aggregate) products. ADDENDA. A dramatic effect of the European created Oceanic-global trade era was the Columbian Exchange; but that was, in the spreading across the globe of crops and animals, more a matter of changing local production patterns than trade as such. One of the high value items tending towards mass trade in the Atlantic economy was the Atlantic slave trade, in itself partly a result of the population collapse in the Americas due to the importing of the Eurasian disease pool to the Americas as part of the Columbian exchange. The Atlantic slave trade manage to move across the Atlantic likely similar magnitudes of African slaves as the Saharan slave trade had across the Sahara (with likely similar death rates, particularly when the death rates from creating eunuchs are included) but in just over three centuries rather than twelve. This entry was written by Lorenzo, posted on at 10:21 am, filed under Blogging, Books, Economics, History, Immigration, Politics, Public Policy, Society, Taxation, Technology, Welfare. Bookmark the permalink. Follow any comments here with the RSS feed for this post. Post a comment or leave a trackback: Trackback URL.